I ran the Spectrum Health Irish Jig 5K yesterday in East Grand Rapids, Mich. While it’s common sense to go to bed early the night before a race, my body is not programed to do so. 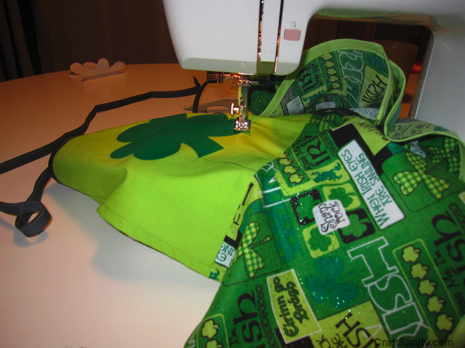 Instead, I stayed up until 1 a.m. the morning of the race to finish sewing six shamrock race aprons for my team. I know my priorities seem a little messed up, but I have no regrets about racing tired. I finished the race with a 7:39 average mile split which is okay. My time was more than a minute off my personal best, but it’s early in the season. I’m okay with my performance given all the sewing I did the day before. It was fun to run with teammates sporting green aprons. People wear green tutus for this race, so we actually looked pretty normal running down the street in aprons. You can read more and see how we looked by visiting my running blog.